There’s been a lot of talk about lemon water benefits and what it can do for your system when you drink it every day. While there aren’t any scientific studies to base the claims off of, the health benefits of lemons and a well-hydrated body are known. Always drink your lemon water hot in the morning. Your digestive system and other internal organs have been rejuvenating themselves all night, and a cold beverage is not the wake up call they need. Consider adding a teaspoon of raw, organic honey to your lemon water if you don’t like the sour taste of plain lemon juice in water. One of the more intriguing benefits reported on lemon water is the ability to help you lose weight. There are a few factors that contribute to this, the first being that there’s no better way to start the day than drinking water. But water alone only hydrates the body, which is beneficial but may not be enough to help you lose weight.. The lemon juice you’re adding to it is going to help you feel less hungry, so you’ll be less likely to eat a big breakfast and can sustain yourself on less. It can also help you avoid using stimulant drinks in the morning, which only serve to make you crash later. Regardless of what you do the rest of the day, starting it off with a glass of lemon water will help. Use it in conjunction with a weight loss program or combine it with healthy eating habits and it will make a difference in the way your body digests the foods you eat. Why add it to your morning routine: Starting the day with a hot water and lemon will help your digestive system function better, which should help you with any weight loss efforts. Lemon juice contains plenty of Vitamin C, so you can be sure that you are starting the day off by getting your Vitamin C levels on track. Your immune system is responsible for much more than helping heal cuts and keeping you from catching that cold that’s going around the office. Long term it can help you avoid more serious diseases like cancer. That’s why you should make it daily practice to drink lemon water as well as eating foods that keep your immune system humming along. As an added bonus, drinking lemon water also helps to keep your lymphatic system running smoothly. This alone can be worth it to those that have been having trouble in that area. Why add it to your morning routine: The immune system relies on Vitamin C to operate at its best. Lemons are a good natural source that your body can absorb quickly and put to use right away. If you could take a snapshot of the way you feel when you’re dehydrated, and again how you feel when you’re hydrated, you’d never want to be dehydrated again. But unfortunately there’s no way to take a before and after picture of the way you feel, so you’ll just have to do your best to stay hydrated without that as a piece of motivation. The morning is the best time to start the hydration process, as you’ve been sleeping all night with no intake of water. But for many the morning routine is a glass of juice or a cup of coffee, which is only counterproductive to the hydration process because of the way these beverages act on the liver. Compared to starting off your day with a cup of coffee, which only acts to dehydrate you, a mug of hot water with lemon starts you off with a burst of hydration. Why add it to your morning routine: You’ve just gone without water for 7-8 hours while you’ve slept. Time to give the body what it needs. 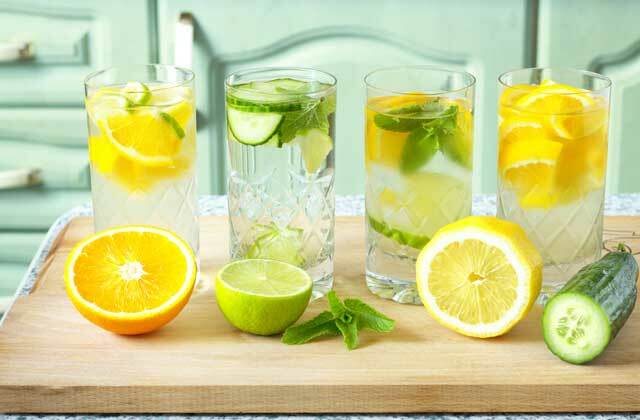 Lemon water first thing in the morning will help you digest your breakfast better, which means your body will be able to absorb the nutrients from your breakfast more effectively, which should mean a much better start to your day. You’ll also be helping your digestive system release stored up toxins thanks to the lemon juice. The water you’re taking in with it will help flush these toxins from your body. Tip: Don’t start off with cold water and lemon juice, make sure it’s hot. Hot water will help your digestion and is better received by your organs, as they function best at 98.6 degrees. Why add it to your morning routine: Lemon water will help get your digestive system ready for the coming meal. Eat your breakfast 30 minutes after drinking a hot cup of lemon water. Anything that benefits the liver benefits the rest of the body because the liver is so central to the functioning of the rest of the body’s organs. By helping to flush it out each morning you are doing your part to assist it in its proper function. A healthy liver expels more bile and digestive juices into the digestive system, as well as helps your heart do its job better. That’s why you don’t want to neglect your liver any longer if you have been. If you’ve been hard on your liver over the years it’s not the end of the world. The liver is a resilient organ and is always trying to repair itself. Give it a hand by consuming foods and beverages that help it rather than hinder it. Why add it to your morning routine: Your liver is the central hub of your internal organs, and helps with your digestive system, circulatory system, and more. Treat it as good as you can! It may seem hard to make the connection between your lemons, water, and your brain, but there is one. Drinking lemon water may actually help your brain in a few key ways.